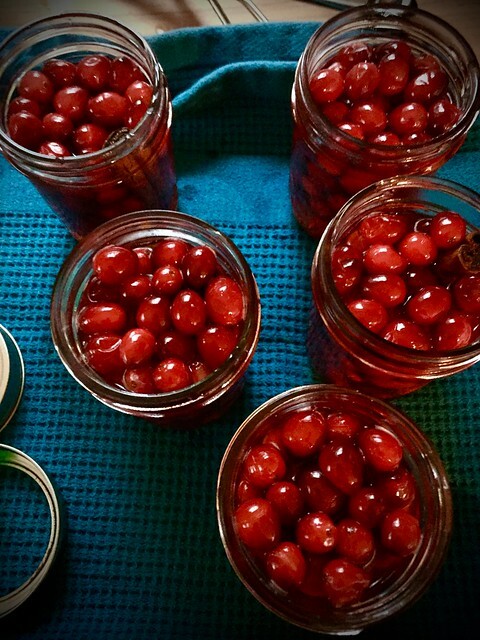 These days leading up to the holidays are hectic ones, and this quick batch of Pickled Cranberries provided an unexpected moment of quiet in the kitchen, a kind of comfort in the making, as well as some glittering, festive jars that’ll keep me from arriving at the coming feast empty handed. These are companionable with roasted meats, like this week’s starring turkey, or a generous platter of appetite-whetting charcuterie. Marisa recommends saving the liquor left behind and adding to sparkling water; I’m imagining other potential libations, as in a blushing cranberry martini or prosecco spritzer. Thinking ahead, the book from which this recipe is from, Naturally Sweet Food in Jars, would be equally welcome as an accompanying gift, as would any of Marisa’s inspiring cookbooks. Wherever you may be sharing a table this Thanksgiving, safe travels, dear friends, there’s still so much to be grateful for. This entry was posted in preserving and tagged canning, cranberries, pickling. Bookmark the permalink. Pickled cranberries? That’s a new one on me. Very pretty! Your recipes always inspire and your photography is always a delight.